Members of St. Teresa of Calcutta Parish recently celebrated a milestone in the renovation of the parish center at Our Lady of Ransom Church in Mechanic Falls, a project that will eventually include the creation of a new worship site. 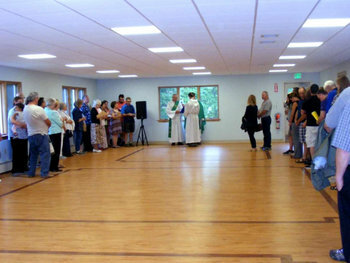 At the end of the July, Father Edward Clifford, pastor, blessed a new parish hall that was created out of a section of the center formerly divided into four classrooms. The project also included installing energy efficient lighting. “The parishioners are enthusiastic about the opening of the hall, as it will once again be a place for community events like suppers and wedding receptions, as well as be available for use by local organizations,” said Father Clifford. 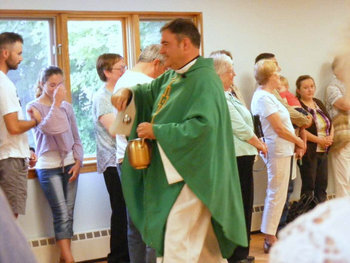 The blessing marks the completion of the first phase of an ongoing project to redesign the parish center, which has been used primarily for Sunday Masses since the former church was demolished three years ago. Father Clifford also expressed his gratitude to parishioners, mostly especially to Hebert and the members of the Planning Committee, and to Bob Rose, a parishioner and experienced contractor, who served as an advisor. He noted, as well, the work of DICON, the diocesan construction company, which oversaw the project. With the first phase of the project now complete, plans will move forward to modify the center’s kitchen and to convert the former parish hall into a new church, a move necessitated by the deterioration of the former worship site. That building, which had once been a barn, had irreparable water damage and mold, which led to its demolition in 2015. Many items from inside the church were salvaged, however, and are still currently in use. Phase I of the repurposed building is dedicated to Father John Dougher, who served the Our Lady of Ransom community from 1982 to 1991 and spearheaded the fundraising and construction of the parish center during that time. At the conclusion of the blessing ceremony, the congregation joined in sing “Immaculate Mary” and enjoyed refreshments provided by the Ladies Guild.